Object Tracking in Arctos is a system that allows collections to track the location of specimen parts via a set of nesting containers (a tree) with or without positions. Barcodes are unique WITHIN Arctos and are used to track the containers. Containers may hold specimen parts or other containers. Containers also may occupy POSITIONS in other containers or may be position-less within other containers. The catalog number and the barcode should not be the same. Barcodes track the containers that hold the physical parts of specimens and because a single specimen have multiple parts, individual barcodes are required for EACH part. Arctos Object Tracking is a parallel, integrated tracking system in Arctos. It can track any part or container independently of whether the item has been cataloged. As such, it can be set up at any point during the history of a specimen to track containers and specimen part locations from the moment of collection through accessioning, preparation, curation, cataloging, and loans. Labels and/or Barcodes can be used to track part locations a. Labels AND barcodes are mandatory if the object tracking system is to be used as designed b. Barcodes are highly recommended for large collections to minimize transcription error c. Barcodes may be 1D, 2D, RFID, base 10, base 36 etc; with human-readable text allowable d. Labels are prone to misspellings and/or duplicates which hinders search and tracking 7 .Barcodes must be unique values across all collections. Because Object Tracking is a shared system, barcodes must be claimed in advance to avoid duplicates across collections. As you plan how you will use barcodes, it is important to remember that barcodes are used to track CONTAINERS as well as to consider how the nesting of containers will help you manage your collection. Once you have built your tree of containers, the next step is to determine how you want your barcodes to look. Barcodes are shared between institutions and departments therefore they must be unique across ALL Arctos institutions and collections. You can post an issue to GitHub to request a barcode series, or if you are adventurous, you can follow the steps below to research a claim a barcode series yourself. These steps allow you to see if the barcode series you want is already used in Arctos, and if it is not, how to claim that series. Test the barcode that you want to use before staking a claim. If a row highlights in green, that barcode is already in use and you will need to come up with a different barcode series. If nothing turns green, you can claim that series. BEFORE you click "stake a claim", if you have no experience writing SQL, we suggest you find a barcode series that is similar to the one you want to claim and copy the SQL code. You can then edit that SQL to write what you need to claim your series. Repeat steps 1 and 2. Hopefully, your entry will now turn green. If it does not, the SQL is not correct and you'll need to correct it. If it turns green, proceed on! 1D Barcodes are well-suited for larger barcode series while 2D Barcodes can be used for any size. For any situation where printed barcodes will be small (cryovials, insect pins) 2D Barcodes are preferable. You will likely find that you can either use 2D Barcodes for everything or you will use 2D for smaller containers and 1D for larger. Barcode scanners come in many shapes and sizes. The main thing to remember when purchasing a scanner is that some scanners will not read 2D Barcodes, so if you plan to use 2D Barcodes, make sure the scanner you choose will be able to read them. A list of suppliers used by Arctos Collections can be found in the RESOURCES section of this document. Also, be aware that some scanners may be specific to an operating system, so also check to make sure the scanner you choose will work with the operating system of the computer that will be used with the scanner. Barcodes can be printed on adhesive or non-adhesive media. It is important to consider the container on which the barcode will be placed when selecting a medium. Some containers require an adhesive label (cryovials, freezer boxes, freezer racks) while others work better when printed on a non-adhesive medium which can then be placed in a container (fluid storage jars) or in a label holder on a container (sign on a room or magnetic label holder on a shelving unit). Remember that adhesive medium durability depends on the material and the adhesive. XyResist® Plastic or Chemical Resistant Polyester Labels can be used with alcohol although we have not tested it for long term submersion. CryoLabel® plastic labels are recommended for use in liquid nitrogen and ultracold freezers. If you are unsure about any medium that you are considering, consult with the supplier and if they are unable to make a recommendation, post an issue to the Arctos GitHub to seek advice before you buy. How Many and What Size and Shape? As part of this decision, you will also need to consider the size and quantity of each barcode you expect to need. In general, it is good practice to print at least two labels with each barcode that will be placed on the “leaf containers” of the nested tree. This allows you to place a barcode on the container and another on a page of a paper catalog or an inventory of specimens to be cataloged. Some collections print three adhesive labels for cryovials; one circular label for the cryovial lid, one circular label for the paper catalog, and one wrap-around label for the cryovial. Duplicate labels can be problematic if you don’t have a planned use for them, so make this decision with care and ensure that placement of all copies of any given barcode are written into your barcoding procedures so that two different leaf containers don’t end up with the same barcode. This generality may not be applicable in some situations, such as with leaf containers that house more than one specimen (a jar of frogs). When thinking about label size, consider whether containers are of uniform size. When containers that will use the same barcode series are of variable sizes it might be important to order media that is sized to fit the smallest container (skeleton boxes may be 1” x 1” x 3” or 1’ x 1’ x 3’). This will allow you to use a single, printed series on all of the containers of a given type. For most applications, rectangular or square barcodes work fine, but for cryovials you may want a circle that fits the lid of the vial. Barcodes can be pre-printed by a vendor or you can print them yourself. As with selecting a medium, it is important to consider the container on which the barcode will be placed when selecting a printing method. For containers that require an adhesive medium, a small barcode label, or where the printed barcode will be immersed in fluid, pre-printing by a vendor may be preferable as special printers, ink, software, and medium may be required to print them in-house. For barcodes that will be larger and do not require adhesive, in-house printing is much less expensive and allows multiple copies of a barcode to be printed (as when a printed barcode is mutilated or destroyed or if it is assigned to a new container). With both options, be aware of possible duplicates whether through ordering duplicate barcodes or through printer error. As you answer the questions above, document your decisions and review everything before you place orders with vendors. Have others who will use the locator system in Arcos review the plan as well to make sure you haven’t missed some detail about how those in your museum expect to use the barcode/locator system. Draft written processes for barcoding items already in the collection as well as how new items coming in will be added to the locator system. This process will help you work through all of the decisions above and will prevent surprises that require you to re-print barcodes, order additional copies, or re-start the process from the beginning. Consider presenting your plan and process drafts to experienced users of barcodes and object tracking in Arctos. You may get excellent feedback (and you may teach them something!). You have created your object tracking in Arctos plan and claimed your barcodes in Arctos, now you are ready to purchase, print, and prepare for adding barcodes to your containers. If you are ordering pre-printed barcodes be sure to test one as soon as they arrive. You can test both your scanner and barcodes by scanning a barcode into a cell of an Excel spreadsheet. Make sure the barcodes are part of the series you have claimed in Arctos! If you are printing barcodes in-house, you should also test them with your scanner. There are several ways that you can generate and print your own barcodes. See the Resources section of this How-To to find out more about them. A) CONTAINER_TYPE: A list of container types can be found here here: OR by visiting the code table code table If you cannot find a container type that works for you, submit an issue in GitHub to ask the community for guidance or request a new container type. Do not use POSITIONS as a container, they are a very unique container (see documentation). If it loads correctly, you will get the message "loaded - proceed to validate"
If there are errors, you will see them in a column with error messages. You will need to delete everything from the bulkload stager, make corrections in your spreadsheet, and return to step 5. If everything is valid, click proceed to upload. You are done-ish! Currently all of the barcodes you created are in the "Universe". It is perfectly fine to leave your barcodes here until you apply them to a container, but you may want to move them to your Institution or some other location (The room or cabinet where they are stored might be logical choices). To accomplish this in bulk, you will use Move Container Batch Scan which requires that you prepare a CSV file with the appropriate relationship information. Click on "Upload CSV file"
Alternatively you can move barcodes one at a time or in batches by scanning them into the appropriate parent barcode using the NON-BULK WITH BARCODE SCANNERS function which is generally used to scan objects into their location when only a few objects at a time are being moved. NOTE: Before scanning barcodes, set your scanner to tab after scan so that you can moreeasily move to the next field when scanning. Place your cursor in the first "scan barcode" field and scan the first object barcode you want to move into the parent (shelf, tray, etc.). Continue the process until you have all of the children scanned in. The scanner will automatically move you to the next blank field if it is set on Tab. Wired 1&2D Scanner: Zebra DS6708-SR Handheld 1&2D Digital Imager $380 Cordless (Bluetooth) 1&2D Scanner: Socket CHS 7Xi 1&2D Cordless Bluetooth® Scanner $540 Wired 1D Scanner: Symbol LS2208 Economical Handheld Scanner & Stand Kit $155 For used barcode scanners and other supplies at a discount, check out eBay. You can find these scanners used for a significant discount. You may also want to check with your IT department as they may have scanners available for you to borrow. Preprinted barcode labels can be purchased from Electronic Imaging Materials(EIM). Contact customer service for help to design and customize your barcodes. From Electronic Imaging Materials, UAM purchased a TSC TC300 (300 dpi) Desktop Label Printer that comes with BarTender Lite software for designing and printing barcodes. The program allows you to create barcode series and remembers the last barcode printed to reduce printing of duplicate barcodes. When purchasing barcode rolls, select Thermal Transfer print method. More information on Direct Thermal and Thermal Transfer Labels can be found on the EIM webpage. The TC300 printer takes a 1” core size. For different sizes of barcodes than found on the website and for more information on getting setup to print, contact EIM customer service. Barcodes can be generated from text in several different ways using readily available software. 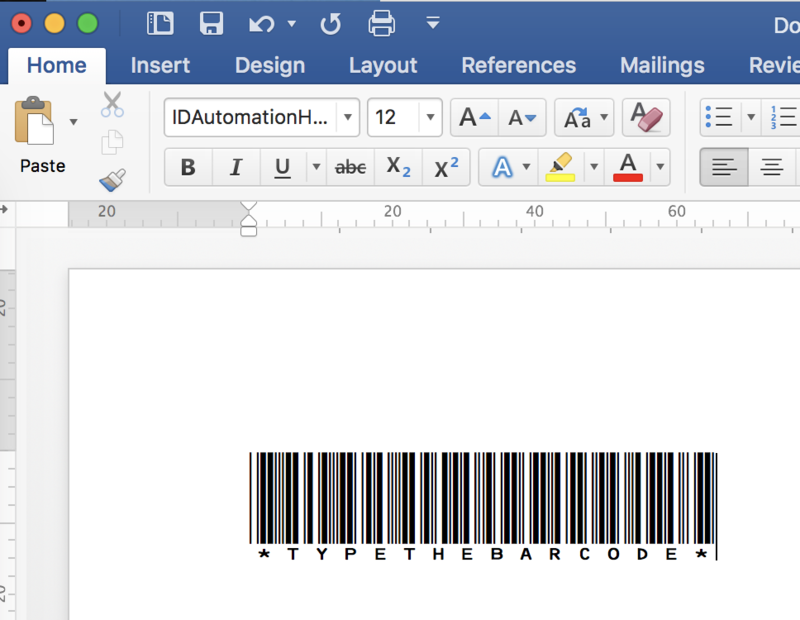 Microsoft Word has barcode creation capability built in and a tutorial is also available (Arctos is not responsible for the content – it is a bit sarcastic). Or you can download a barcode font, add it to your Microsoft Word font list, and type up whatever barcodes you want. To find a barcode font, Google Barcode font for office or something along those lines. You can also find them at http://www.fontspace.com/category/barcode. Select a Code39 as it works best with most barcode scanners. To add a barcode font to your Microsoft Office Word, follow the instructions at PC: https://www.wikihow.com/Add-Font-in-Microsoft-Word for PS or https://www.popsugar.com/tech/How-Install-Fonts-29788862 for Mac. **This section is a work in progress. BarTender is a software package that comes with barcode label printers. UAM runs the UltraLite version that comes free with the barcode printer whereas MSB runs an upgraded version. This is basic how-to is for the UltraLite version and is a work in progress as we learn how to use the program ourselves. When I have questions about using this program, I have found that the online how-to videos I google have been very helpful. Select "start a new BarTender document"
Select Blank Template and hit next. Side Edges: use a ruler to measure the space on the edges of your roll. Enter the value for the left and right. For current selection of barcodes it is about 1/16" or 0.062". Printed item shape: select shape that best describes your barcode. Most are rounded rectangle. Template size a. Enter the width and height of your barcode. For height, this is the barcode plus the space on top and bottom of the barcode. b. Select the orientation you want to print your barcode. c. Select effect if you are using it. Template background - leave blank unless you want to get fancy.